a shotmaker’s dream with small greens, rolling terrain, and tidal creeks. 41 House, named in honor of longstanding member President George H.W.Bush, is our historic Arts & Crafts style Club House nestled beside the Kennebunk River. A straight-away hole of 375 yards, with the Kennebunk River on the left and native grasses on the right. It requires a drive over a deep gully that lies 165 yards from the green, setting up a mid-iron shot to a subtly undulating green. A drive of 220 yards, which avoids water on the left, and the mounds and trees on the right, will leave the golfer a short pitch to the green. Club selection and accuracy are critical on this hole. A well played tee shot, using a mid-iron, to the right center of the green is ideal. A variety of hazards await an errant shot. A long par 4 which turns right requires a strong tee shot to the center of the fairway. Accuracy is at a premium with pines on the right and native grasses on the left. A long second shot, where the "bump and run" can be used, will be needed to reach a green that features deceptive contouring. Driving the green is an option for the long hitter, but tee shots must avoid a small stream and apple orchard. The safe play is a tee shot of 220 yards, leaving a short iron to a wide but shallow green with a large mound in the middle. Two pot bunkers protect the front of the green and a narrow bunker captures the shot that runs through the green. 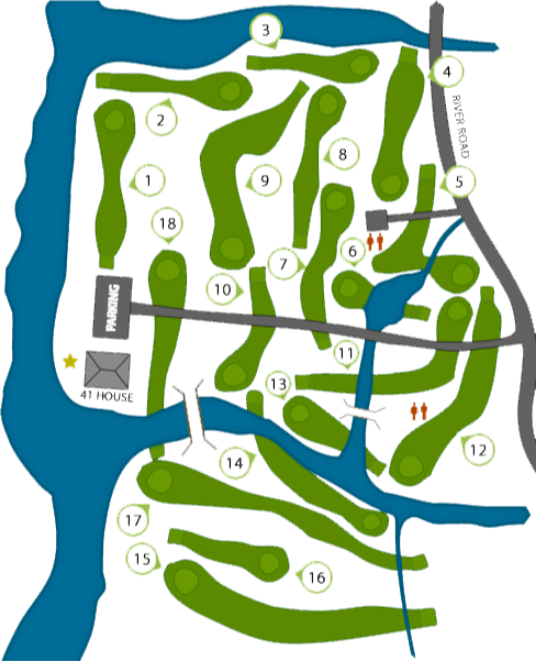 A short par 3 over a pond to a two-tiered green where club selection is very important. The sea breeze must be accounted for. Water and pot bunker await a short shot, and a shot over the green will leave a difficult down hill chip. A challenging par 4 that often plays into a prevailing wind. The fairway is guarded on the right by large mounds, native grasses and well placed bunkers. Any tee shot that finds the fairway will allow access to a well protected green. A tee shot placed down the right side, that avoids trees and fairway bunkers is ideal. The approach shot is played over two cross bunkers, to an extremely narrow, undulating green with run offs on three sides. When the pin is on the top shelf pars are hard to come by. A tee shot that turns left, thus avoiding two fairway bunkers that guard the right corner, will allow the golfer to play a second shot over three cross bunkers. A tee shot that does not carry the corner will force the golfer to lay-up in front of the cross bunkers. A third shot of 110 yards to a false fronted green awaits. Though a dog leg right, a tee shot that favors the left side of the fairway providers the best line to a very narrow green perched above the river. Approach shots that miss that green left, right or long will challenge the golfer's short game skills. A tee shot of 220 yards over the water will set up a birdie opportunity when the pin is on the lower tier. When the pin is up on the upper tier, par is a good score. is often not felt while standing on the tee, must be taken into consideration. Short shots will find the water, and bunkers on the left and right will capture the errant shot. A tee shot that carries the river and draws is ideal, but it must avoid the water all along the left. A mid-iron second shot to a well guarded green awaits. A short hole where a birdie can be made. A tee shot of 220 yards will leave a short or mid iron to a small green. An apple tree which guards the right front must be avoided. A 210 yard par 3 which requires length and accuracy. Trees and ledge guard the right and numerous mounds guard the left. Par is always a good score. A straight away par 4 with a generous fairway. The blind second shot is played over a large cross bunker to an inverted green, where luck rather than skill, is often rewarded.